Things You Should Know To Become a Dedicated WordPress Developer? WordPress has taken the world by storm and there is a small barrier between working with and using WordPress. WordPress is the most popular content management system which is built on HTML, CSS, and PHP. So, anyone who is familiar with these three languages can immediately start using WP as per their needs and specifications. But if you want more from WordPress than just working with it, you have to be an over-achiever. In addition, if building a strong business, establishing a better brand identity and gaining respect is what you aim at, learning to work with WordPress is the only solution. Simply because there are many other professional and highly skilled and dedicated WordPress developers available who are also putting their efforts in the same industry to engross clients and earn a buck. Fortunately, WordPress doesn’t let anyone down. There are a plethora of options for you to step ahead of the basics of customizing a website so you can consider yourself on the list of skilled and pro WordPress developers. If you are a beginner, then it is worth knowing the concept of theme customization and tweaking through child theme before plunging into the ins and outs of WordPress. However, we are assuming anybody who is reading this article already knows the basics of using WordPress and the fundamentals of customizing a theme.Having that said, WordPress theme customization is the best way to get started with WordPress though custom functions and plugins are extremely helpful. But the tweaking theme is an important part of every WordPress website. Whether you are customizing a ready-made theme or building one from scratch, you need to be familiar and comfortable with WordPress customization system. Having that said, WordPress theme customization is the best way to get started with WordPress though custom functions and plugins are extremely helpful. But the tweaking theme is an important part of every WordPress website. Whether you are customizing a ready-made theme or building one from scratch, you need to be familiar and comfortable with WordPress customization system. For tweaking a theme, you may or may not need the entire file system of WordPress. However, the major files required are index.php and style.css. The later one is used for the styling of the site whereas the former is the used for the basic appearance and functionality of the site. The main idea of customizing a theme lies in getting to know the concept of child themes since it is always a best practice to tweak the look and feel of a site through a child theme. Using child themes has a lot to do with keeping the modifications you’ve made after every update. The main two aspects of WordPress are themes and plugins. Themes are for the appearance and layout of the website and plugins are for the functionality of a WordPress site. Once you have understood the basic fundamentals of theme customization, the natural follow-up would be to plunge into plugin development. Building or tweaking a WordPress plugin is not an easy job but it indeed is easy if you practice. Moreover, since WordPress is growing with the passage of every day, it becomes quite easier to find various resources online that makes things a lot easier for beginners. Well, WordPress Codex needs no introduction for those who are familiar with WordPress. 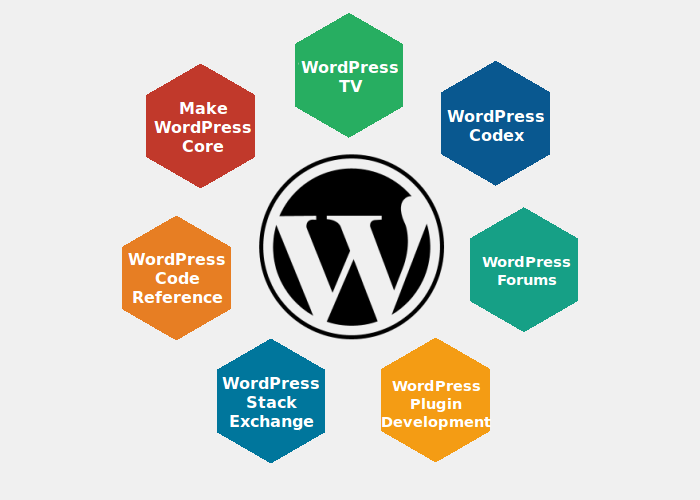 WordPress Codex has almost everything for a dedicated WordPress developer. It is like a WordPress bible for the developers. You probably have used WordPress codex for many times, like installing a multi-site website, or setting up a child theme, or reading up on detailed information on theme customization. If you are one of those who finds reading boring, you’d probably find WordPress TV quite useful. It is certainly a big thing in the history of WordPress development. WordPress TV displays all the WordCamps recorded videos which are held in different parts of the World. WordCamps are organized for WordPress lovers, who discusses all WordPress and share ideas to grow this popular content management system. These videos are easy to find on the internet. Moreover, you can also watch somebody give a presentation on a particular topic, which is indeed quite engaging than reading a blog post about it. Wordpress also offers an official blog for WordPress developers. The blog offers constant updates on new themes, features, and versions of WP. As a matter of fact, in order to stay ahead in the competition, it is really important to know what’s happening in the world of WordPress. And nothing is better than Make WordPress official blog to stay up-to-date with all the news and updates of WordPress. Wordpress Code Reference is also an official page of WordPress that assists you in finding more information about WP hooks, methods, classes, and functions. The Code Reference page features a search box along with filter feature. The filter feature allows you to search by methods, classes, functions and hooks. The page also lets you browse through the same topics merely by clicking on the links given. Wordpress Plugin Development Handbook is an official handbook designed and launched for WP Plugin developers. Whether you are looking to tweak the existing plugin or develop one from scratch, WordPress Plugin Development Handbook is a great resource to get started with plugin development. WordPress Plugin Development Handbook is able to answer all your plugin development related queries. Wordpress has a huge community of developers and volunteers. WordPress offers a forum for its users to help them ask their WordPress related problems. From WordPress themes to widgets to CSS Customization to plugins, WordPress Forums has got you covered with a variety of different topics covered in it. Wordpress Stack Exchange is yet another great resource to get answers to all your WordPress relations questions. WordPress Stack Exchange is another type of WordPress forum that covers a variety of topics. Since many people can face the same problem, WordPress community searches around and find the best solution possible and if you got to find one, allows you to share it with others. Learning is a never ending process and the sooner you realize it, the faster you can grow. One needs to put consistent efforts in order to become a skilled and professional WordPress developer.